Mouse macrophages are extensively studied in tissues and tumor. For reliable isolation of mouse macrophages, gentle dissociation of lymphoid tissue is key. Mouse spleen can be dissociated into single-cell suspensions using our Spleen Dissociation Kit, mouse in combination with the gentleMACS™ Dissociator with Heaters. Mechanical dissociation with enzymatic degradation of the extracellular matrix maintains the structural integrity of tissues. Watch how simple it is to dissociate mouse spleen tissue with the gentleMACS Dissociator. We have developed a fast and efficient way to isolate mouse macrophages based on their specific F4/80 markers by using Anti-F4/80 MicroBeads UltraPure, mouse. Isolation of F4/80+ macrophages. F4/80+ cells were isolated from spleen single-cell suspension using Anti-F4/80 MicroBeads UltraPure, two MS Columns, and an OctoMACS™ Separator. The cells were fluorescently stained with CD45-VioBlue®, CD11b-APC, and Anti-F4/80-FITC and analyzed by flow cytometry using the MACSQuant® Analyzer. Cell debris and dead cells were excluded from the analysis based on scatter signals and 7-AAD fluorescence. We offer various reagents and kits for the isolation of mouse myeloid cells from tissues and tumors. Download the poster and find a comprehensive overview of all myeloid cell markers and products for convenient isolation and analysis. Working with MDSCs? The Myeloid-Derived Suppressor Cell Isolation Kit, mouse has been developed for the isolation of CD11b+Gr-1+ myeloid cells from mouse lymphoid tissue. 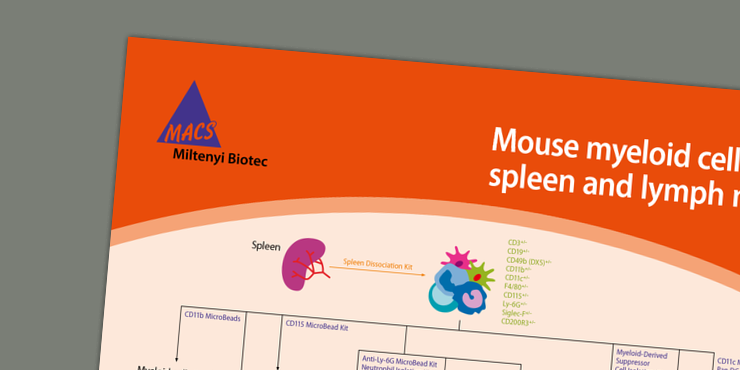 Find out more about products for mouse myeloid cell research in tissues and tumors in this poster. Macrophages can be generated in vitro from human monocytes using Human M-CSF, premium grade or Human GM-CSF, premium grade .